I’m sure most of you are following Naruto Guides for quite sometime. If you’re new to this site, welcome on-board. I’ve thought of doing guides on Main characters of Naruto Online when I started off. As I was more focused in developing content for the different types of ninjas, I totally forgot about it. So let’s just start of with the Lightning main guide. In this guide I’m just going to bring you through that important things you need to know about Midnight Blade. I won’t be discussing about team builds in this article, I will do it in another article which will be under the Team Builds guide. So far I’ve done two Team Build guides but those builds are well suited for P2W (Pay to Win) players. I’ll definitely come up with some of the best team builds for F2P players. I’m a F2P player myself. It’s not that I can’t spend money on the game, it’s just that what’s the point playing a game if you can buy everything with money. It will not be competitive enough. There are certain things which are worth spending on. I will also write article on the things which are worth spending in coming weeks. Rather than rambling about other things, let’s move on to the Lightning Main Guide. What you need to know about Midnight Blade? Midnight Blade is one of the main characters you will have to choose when you start the game. He is a Lightning type Ninja and wields sword. Midnight Blade can be used mainly for support and damage. But most of the time it’s best to use for damaging purposes. Multiple attack by Midnight Blade with the right talents. There are 5 rows of talents for each main characters in Naruto Online game. First row will be Mystery skills. As you can see on the above table, there are 4 different types of mystery for Midnight Blade character. These mysteries will be unlocked one by one as you level up throughout the game. It is hard to argue or justify on the best mystery. The effectiveness of the used mystery will heavily depend on your team build. There are 4 types of Standard Attacks for Midnight Blade which gets unlocked when you reach certain level. The three first standard attacks provides damage towards the opponent’s units. The last standard attack focuses on recovery of Chakra and Life point while being immune to Debuffs. The last standard attack will be extremely useful when you have a ninjas whom are dependent on high chakra to use the mystery skills. In that case, recovery of chakra will help those ninja characters to use the mysteries early in the game. For example, if you have Tenten (GNW) or Mei Terumi (Fifth Mizukage) in your lineup who causes massive AOE damage will benefit from your Lightning Main’s 4th Standard Attack. The 3 first passive skills are the ones often used in Lightning Main Lineups. I’ve never used or came across anyone using Heart Flux unless your Midnight Blade has the highest damage output in your team and can defeat the entire opponent’s team. No matter what, these passive skills will provide huge boost to your team. For example, if you’re using Lightning Ninjas in your team you can use “Lightning Enhancement” which will increase their Ninjutsu and Attack by 40%. Same goes to “Warrior’s Killing Intent” which increases Attack of Sword using ninjas. If you want additional sustainability for your team, Anbu Special Assault Tactic will be a great option. These passive skills are pretty good. Especially the first 3 passive skills. If you need a defensive line to tank damage and cause slight damage to the opponent’s units, Clone Combination Tactics will be a great choice. If your Lightning Main has the tendency to cause more damage than the other ninja units, you can choose Bloodthirsty Demon as it will grant Two Standard Attacks. When Bloodthirsty Demon passive is combined with Lightning Armor Mystery, your Midnight Blade will attack for 4 times consecutively. When you’re Sword ninjas like Darui or Mifune, Root of Warrior will provide Debuff immunity and 100% Resistance increase which will allow them to get strong early on. We’ve covered the most basic part of Lightning Main character. I know you want to know the best lineup for Lightning Main character. As I’ve mentioned earlier I won’t be covering team builds in this guide. However, I will give 2 teams that you can use until you reach level 60. If you manage to get some of the super rare ninjas by level 60 use them. Just make sure you get your chase skills and summons right. This lineup is F2P Lightning main team lineup which will be good till you reach level 60. Sometimes you can also use this same lineup till you get some other rare and super rare ninjas that will sync well with your Midnight Blade character. In this lineup, Kimimaro Attack and Mystery will get the highest hits and combo for the team. The skills of Midnight Blade will provide additional damage and great boost for the as well. Chidori Blade mystery will help to paralyze almost the entire team and will stop them from using any chase skills for that round. Beam of Light will cause Knockdown which will be followed up by Hinata and Sasuke chase skills. 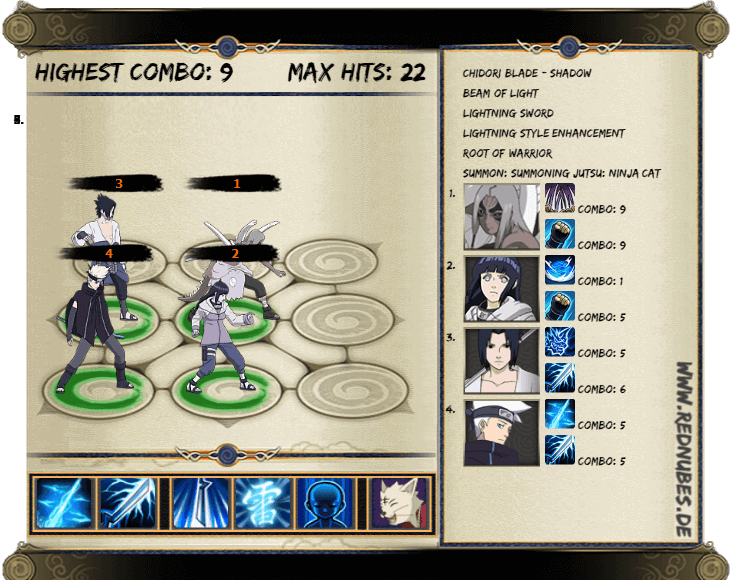 As the whole team has Lightning attribute, it will give Attack and Ninjutsu boost for every ninja in the lineup. The other passive Root of Warrior will provide Debuff immunity for Lightning Main, Sasuke and Kimimaro. (but this skill will only be available at level 55). I chose to use Ninja Cat as the summon because you would not gain any orange summon as a F2P. So, it will be easier to catch Ninja Cat summon and use it for this lineup which will help you increase the number of combos. I will share more advance team builds for Lightning main team soon. Those team builds will be more to P2W. However, some of the lineups are achievable if you save on your coupons and spend them on the right events. What do you think about this Lightning Main character guide? Did I missed out something? Please do share with us by commenting below. I think instead of using just normal Hinata we should use Hinata gnw since she has high dmg as well as recovering its HP after its death. Well, I just want to give lineup for F2P players as it will take longer for them to Hinata GNW. However, I agree that Hinata GNW is better compared to normal Hinata.